Minho was sitting on his make-shift bed in Onew&apos;s room, drying off his hair with a towel. He&apos;d taken an extra long time in the shower, thinking things through, but he still didn&apos;t know what to do about Taemin. He wasn&apos;t even sure if it was his decision at all. Would he let some small mistake ruin his relationship with the one person he loved the most? Though it wasn&apos;t a small mistake. It was a pretty damn awful mistake. Someone knocked on the bedroom door. "Minho." It was Taemin. Minho froze, his mind blank. "Please talk to me," the boy on the other side of the door whispered. "Taemin," Minho muttered to himself, getting to his feet to open the door. The least he could do was talk to him. Even though it was selfish, Minho sort of hoped that Taemin was feeling as crap as he was about the whole situation. At first, Taemin just seemed surprised that he had opened the door to talk to him, and then he blushed, seeing that Minho wasn&apos;t even fully dressed yet. "What do you want?" Minho asked, leaning against the dor frame, barely phased by Taemin&apos;s awkward staring. "Please don&apos;t be like this, hyung." Taemin looked to the floor. Minho couldn&apos;t help but feel guilty about how he had treated the poor boy - it was hard to believe that this innocent Maknae was the same person that kissed his friend in front of thousands of people. But Taemin would have to learn his lesson, there was no way he would be forgiven so easily. Minho shook his head: "No." "No?" Taemin echoed, as if he couldn&apos;t believe he had just been rejected. "Your puppy dog eyes don&apos;t work on me anymore," Minho declared, though that wasn&apos;t the case at all - he was trying desperately to keep his eyes away from Taemin&apos;s, because he knew that he would only fall for him over again if he even glanced at the young boy for even a moment. Taemin giggled; he wasn&apos;t falling for it. "Oh, please, they work on everybody. Even you, hyung." Of course, he was right but Minho&apos;s previous statement still stood: he wouldn&apos;t let Taemin get to him, not just yet. "This isn&apos;t funny," Minho protested, crossing his arms. "You&apos;re going to have to make it up to me." Minho stood silent for a moment, unsure of what to request - if he should even request anything. It would seem that Taemin would - quite literally - be his slave if Minho asked him to. But that would be wrong, and after all, two wrongs definitely don&apos;t make a right. "Let me think about it," Minho said finally. Taemin nodded, though obviously disappointed with his answer. "Think quickly," Taemin muttered as he turned away from Minho, "I don&apos;t want you to hate me forever." Minho watched as Taemin spun on his heel and shuffled away with his head hanging low. He couldn&apos;t keep this up forever, neither of them could. They both knew that the only thing keeping them happy was each other. Minho rubbed his face, completely out of energy. That left a very exhausted Minho wondering what on Earth he was going to do about his silly little Taemin. Jonghyun bounded back into the room with a smile on his face - a smile that had definitely not been there when he had left to &apos;go and find food.&apos; Yet he had returned empty-handed. Jonghyun&apos;s sudden prescence make Key jump from the bed where he was sorting through his suitcase. "Yah! You scared me," Key exclaimed, glaring and pouting - the two things he was best at. "Sorry!" Jonghyun laughed, though it was clear that he wasn&apos;t sorry at all. Key continued to pick through his clothes, even as Jonghyun came up and rested his head on Key&apos;s shoulder. "What&apos;s got you so happy? You&apos;re being extra annoying right now," Key noted, trying to ignore Jonghyun, but his efforts were in vain. "Oh, no reason," Jonghyun replied, bouncing around on the bed, trying to find a comfortable place to sit but ended up scrunching all of Key&apos;s clothes up. "Aigoo~" Key sighed, trying to push the taller boy off his bed. "You&apos;re top bunk, remember?" And why they had bunkbeds was beyond him, but Jonghyun had requested it when they had first moved into their small house, and Key had been more than happy to agree at the time. Now it was just annoying - Jonghyun couldn&apos;t stay still, even in his sleep. And now he was as hyperactive as ever. Seeing that Key wasn&apos;t in the best of moods, Jonghyun stood up. "Come with me," he said, extending his hand out. "Why?" Key asked, glancing at his hand wearily which was now grabbing at the air. "No questions, I&apos;m taking you somewhere." "But why?" Key tried again. Jonghyun tapped his nose with his spare hand. "You&apos;ll see." So Key accepted Jonghyun&apos;s offer - which was more of a command than an option - thinking that, actually, he needed a break from everything and everyone else. 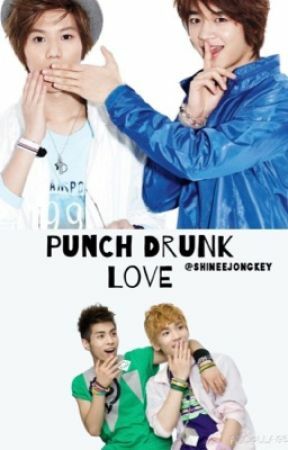 Key may be tired, but he could never be tired of Jonghyun&apos;s company.